Last week was the second time in recent years when the Zulu organization took a courageous stand on a public issue for which there was racially divided opinion on both sides. By rejecting the protesters who were trying to ridicule the group’s long time practice of wearing black facepaint, Zulu stood in defense of its own traditions and against the race-baiters who think they have the power to label anything they want to as racist. This reminded me of the first time that Zulu took a bold stance on an issue and its decision helped revive the city’s spirit during one of its worst hours. During the bad days shortly after Katrina Mayor Ray Nagin went to Atlanta where he met with a group of black displaced New Orleanians. The crowd had the concerns that might be expected with their lives uprooted and the city’s future uncertain. Nagin tried to answer as best as he could. But what the night would be best remembered for was that toward the end of the questioning one woman raised her hand and scolded that with so many people displaced nobody should be thinking about having Mardi Gras parades. Nagin, perhaps caught of guard, agreed. His honor might not have been thinking about the television cameras in the back of the room or the immediacy of modern communication or of the significance of his nod to the affirmative, but by the 10 o’clock news that Sunday night the lead story in New Orleans was that the mayor was saying that there should be no Carnival celebration. Coming at a time when the world’s media were still camped in the city, the statement was flashed internationally and presented as another example of a city so down on its knees that it could not stage a parade. New Orleans without Mardi Gras – perhaps the city was really dead. After returning to New Orleans, it did not take long for the mayor to change his position. Saying he was “outvoted” by the tourist commission, Nagin said he favored a modified parade schedule. Now the trick was in how to modify the schedule. Most parades would have fewer floats and their routes would be shortened. For many krewes smaller was good because they barely had the strength to put together anything. One group that was quite vocal, however, especially about the route shortening, was Zulu. Its officers spoke passionately about being allowed to parade in those neighborhoods with cultural links to the group. Zulu roared. It wanted to be on the streets with its full integrity. There was dissension​ within the Zulu organization. One past king threatened to sue, saying it was inappropriate for the group to march. But the Zulu bosses were undeterred. In the end, Zulu got its way. 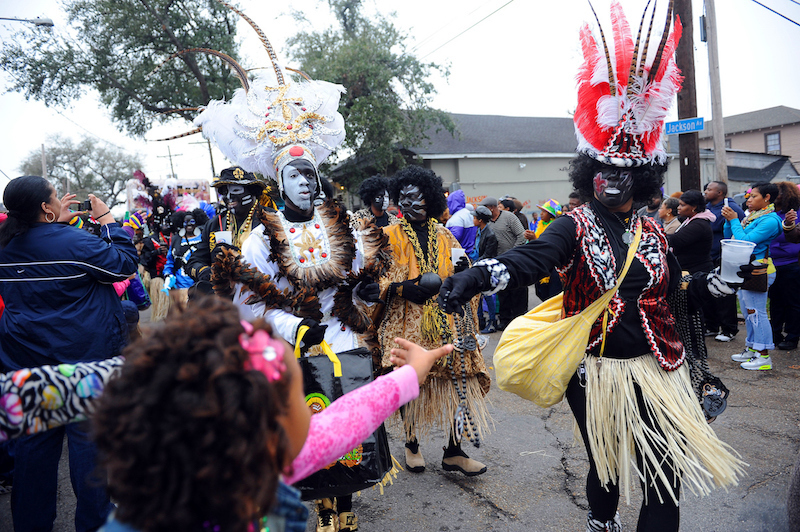 Zulu has had few grander, or more important, moments than in that first Carnival after Katrina. Imagine had Zulu not paraded. With so much media attention and with the very faint heartbeat of the city being overly analyzed, the word would have spread around the globe: white people parading while black people suffer. Truth is there were lots of white folks suffering, too, including many that feebly climbed on floats, some that were decorated with blue tarpaulins to spoof the recovery. By taking a stand Zulu saved Carnival in 2006 and perhaps for evermore. Once the parades started the message was spread that there was still life and joy in this battered city that had risen from its knees if only to yell “throw me something.” Anyone who paid attention might have learned that Carnival is not about racial divides but multiple cultures celebrating in their own way. With Zulu on the march the Mardi Gras Indians could prowl their neighborhoods with a little more spirit, the bars in Treme could put beer on ice. Those people in Atlanta, I suspect they celebrated too. Mardi Gras provides a good excuse to come home, if only for a day. When water rises, coconuts still float. For a different and totally unique perspective on the issue please listen to this podcast of a homily by Father Peter Finney III.